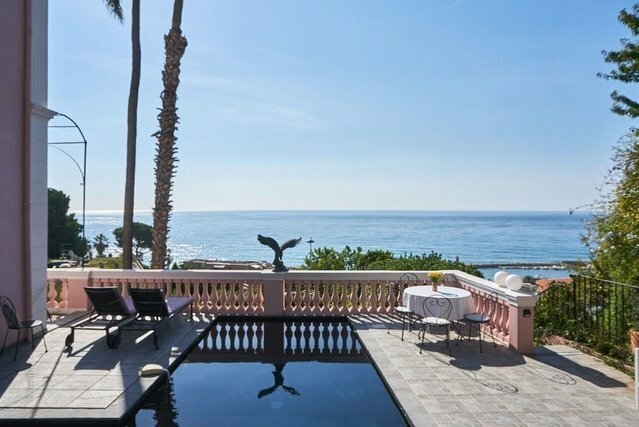 Menton - For sale, a luxury and spacious Belle Epoque property located in the heart of Menton, where the French Riviera and Italien Riviera both meet. Very quiet area with a beautiful sea view. This 294 s.qm property offers in its main part a living room, a dining room, a kitchen, 6 bedrooms, 3 bathrooms, 1 shower room and a separate WC. The property also provides a guardian apartment with its own entrance composed of a living/dining room, a kitchen, 1 bedroom, 1 bathroom. A swimming pool, a sauna and a beautiful garden complete this lovely property situated 20 minutes from Monaco, 5 minutes from Italy and 45 minutes from Nice Côte d'Azur International Airport. Sotheby's Côte d'Azur provides you access to the most prestigious real estate on the French Riviera.